In addition to making dentistry more efficient and interesting for us, advancements in dental technology also make more comfortable and convenient care possible for patients. New technologies and ever-improving treatment methods give patients more choices and are more affordable than ever before. Digital x-rays are comfortable for you and faster than traditional x-rays, with the images available to be viewed on a computer or TV screen in seconds. Some studies cite that they emit up to 90% less radiation! 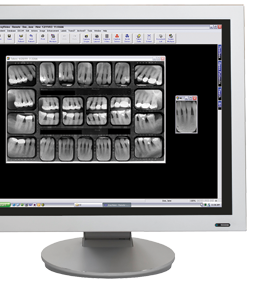 With no chemical processing needed, digital x-rays are easy on you and the environment, too. You may feel that you know your mouth well. It is, after all, your mouth. But wait until you meet your mouth from the inside out! Using an advanced intraoral camera, Dr. Cox will show you your mouth from an entirely new perspective! 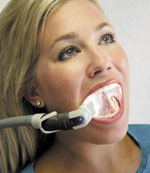 The intraoral camera is a hand-held device that Dr. Cox and his staff use to view hard-to-see areas in your mouth. The camera is attached to a computer screen, allowing you to see instantly what we see. With the push of a button, we can take still photos of your teeth from virtually any angle inside your mouth! The procedure is quick and painless. The live video and saved images collected by the intraoral camera allow us to identify potential problems or concerns, and begin to address them immediately with you. Have you ever experienced fatigue at a dentist's office while trying to keep your mouth open during treatment? If so, we have some great news for you! Dr. Cox uses a breakthrough dental device called Isolite® that will make your next appointment with us quite comfortable. Isolite’s flexible, single-use rubber fitting helps keep your mouth comfortably open, while an advanced suction tube system makes cotton rolls and suction wands a thing of the past! 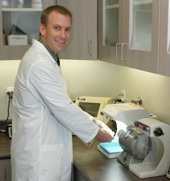 Patients appreciate the convenience of Dr. Cox’s in-office laboratory, which allows him to provide beautiful restorations such as crowns and dentures in less time. Having the lab onsite also enables Dr. Cox to more closely supervise the fitting process, ensuring more comfort for patients. Needed adjustments can often be made in the very same visit! If you have any degree of gum disease, we can help. Gum disease used to require surgery more often than not, but recent advancements in dental technology have revolutionized the available treatments for gum disease. Now, the many people suffering from gum disease have a non-surgical laser treatment option! With the AMD Diode Laser™, we can repair and in some cases even reverse the damaging effects of gum disease. The AMD Diode Laser™ is ultrathin and uses quick pulses of energy to gently remove infection. The procedure is so gentle that is usually does not even require general anesthesia, and the average recovery time is less than 24 hours. Most patients are able to return to their normal activities soon after their procedure. Is Laser Gum Therapy Right for Me? Almost everyone with gum disease is a candidate for laser gum therapy, especially those of you with dental anxieties, busy schedules, or more than one area of your gums in need of treatment. Laser gum therapy is also a safer alternative for patients with diabetes, hemophilia, or those who are taking prescription medications that thin the blood, because the amount of bleeding and risk of infection are much lower than with traditional oral surgery. Gum disease can lead to bone loss, and recent studies have also linked it to an increased risk of heart disease and stroke. If the thought of gum surgery has kept you out of the dentist’s office, contact us today! With HydroAbrasion we can treat cavities in many cases WITHOUT shots or drills. Employing a water abrasion technique, we use a warm, powerful and precise stream of water to remove decay carefully and gently. With this state-of-the-art technology we can help you have a comfortable and effective experience with us. Your teeth can be healthier longer, due to this minimally invasive treatment.